I am looking to find the name of a book I read a few years ago, but cannot remember. I have some information about the book from memory but after an hour searching google I am none the wiser. The image on the front cover is like a dipyramid prism, possibly with a bird. 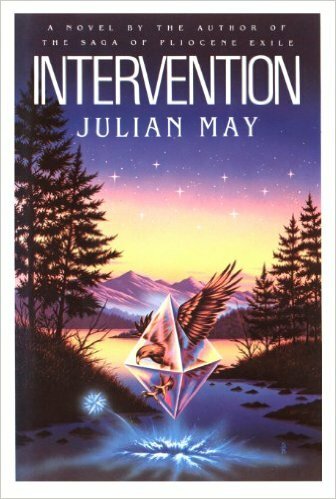 Intervention by Julian May. It's the novel linking the first series (Saga of Pliocene Exiles) and the second series (Galactic Milieu). It shows the childhood of the Remillard family who are all powerful psychics and the key players in both series. Earth is watched over by four alien races, who are debating whether or not to allow humans to join their interstellar society. Sounds a bit like Chocky, by Jon Wyndham. Not the answer you're looking for? Browse other questions tagged story-identification aliens powers or ask your own question.